In what could quite possibly be the final chapter in the Rocky cinematic saga, the riveting and emotional Creed II is available now On Demand and arrives on 4K Ultra HD Combo Pack, Blu-ray Combo Pack, DVD and Digital on March 5. In the sequel to the 2015 hit, life has become a balancing act for Adonis Creed. Between personal obligations and training for his next big fight, he is up against the challenge of his life. Facing an opponent with ties to his family’s past only intensifies his impending battle in the ring. Rocky Balboa is there by his side through it all and, together, Rocky and Adonis will confront their shared legacy, question what’s worth fighting for, and discover that nothing’s more important than family. Creed II is about going back to basics to rediscover what made you a champion in the first place, and remembering that, no matter where you go, you can’t escape your history. Read our review of the blockbuster film here. From Metro Goldwyn Mayer Pictures (MGM), Warner Bros. Pictures and New Line Cinema, Creed II stars Michael B. Jordan (Black Panther, Creed) and Sylvester Stallone (the Rocky films, the Rambo movies), reprising their roles as Adonis Creed and Rocky Balboa. Also returning are Tessa Thompson (Thor: Ragnarok), Phylicia Rashad, Wood Harris, Andre Ward, Florian Munteanu, Russell Hornsby and Dolph Lundgren (The Expendables), returning to the franchise as Ivan Drago. Directed by Steven Caple Jr. and based on characters created by Stallone, Creed II will be available on 4K Ultra HD Combo Pack, Blu-ray Combo Pack and DVD. The Blu-ray Combo Pack features a Blu-ray disc with the film and special features in hi-definition, a DVD with the film in standard definition and a Digital version of the movie. The 4K Ultra HD Blu-ray disc of Creed II will feature Dolby Vision HDR that dramatically expands the color palette and contrast range and uses dynamic metadata to automatically optimize the picture for every screen, frame by frame. 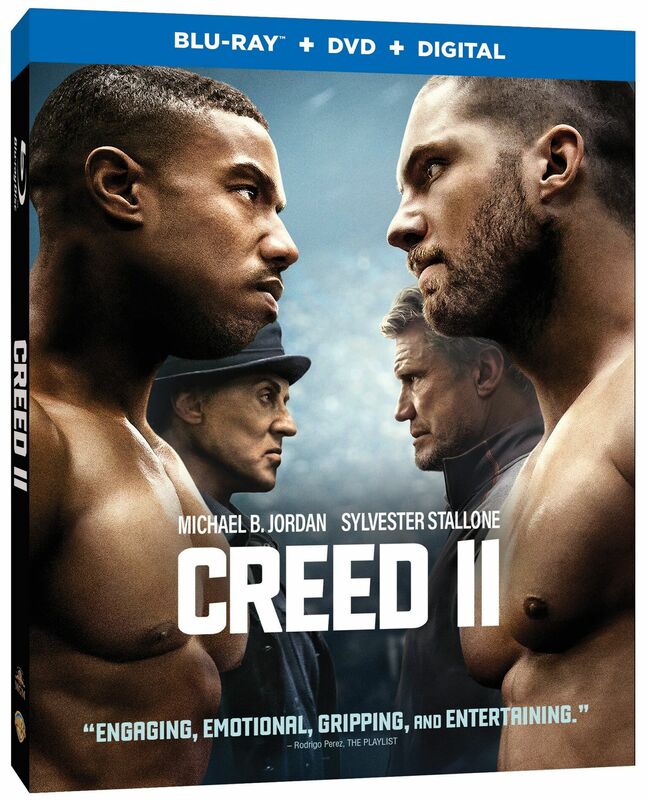 Fans can also own Creed II via purchase from digital retailers in 4K Ultra HD featuring Dolby Vision HDR, high definition, and standard definition beginning February 12 from MGM. With a running time of 130 minutes, Creed II is rated PG-13 for for sports action violence, language, and a scene of sensuality. Enter to win a digital copy of the movie!! COMMENT BELOW with the name of your all-time favorite SYLVESTER STALLONE MOVIE. SUNDANCE REVIEW — "The Report"
Rocky, for sure! Saw it when it first came out in the theater and our audience got up and clapped! Awesome first for me! Demolition Man! That movie was great action and hilarious!!! Rocky IV – Such an amazing film!!! Rhinestone! If you haven’t seen this classic with Stallone and Dolly then you definitely need to!!! Rocky 4. Creed II looks awesome with Ivan Drago back! Mine is Rambo, followed closely by the original Rocky!